Celtic jewellery belongs to one of the world’s oldest art form that originated in Ireland. For centuries, people from all over the world and different backgrounds have been attracted to the beauty of Celtic wedding rings. In today’s market, the wide popularity of Celtic wedding rings is not a new phenomenon. 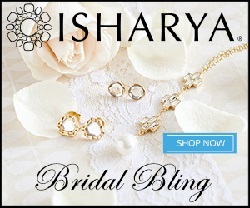 The classic charm and the myths associated with these rings make them one of the most sought after items when people are shopping for wedding rings. Impeccable craftsmanship is evident in their intricate filigree work and the crafting of knots are characteristic features of Celtic art in general. In the olden times, the patterns in Celtic wedding rings were typically worked on bone or slate and they were prepared and quartered in grids. After the designs were chalked out, they were traced or stamped on a foil. Thereafter, with the help of the wires, the edges were curved out to obtain a three dimensional look. Over the centuries and through hundreds of artistic experimentation, Celtic wedding rings have acquired various forms with variations made to the details of the knots and to their prices. 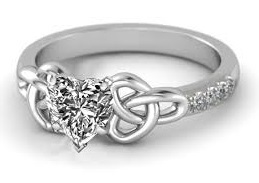 Below are some of the most popular designs of Celtic wedding rings. This design has a thousand years old history and found in the traditional Celtic wedding rings. 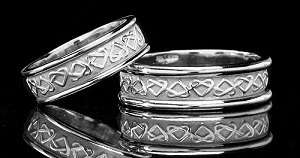 With the knot pattern repeating five times, these rings come in both wide and narrow bands. This design with a pattern of interlinked knots draws inspiration from Scandinavian art and based on the Moughold Cross of the Isle of Man. The band widths generally vary between 7mm and 8mm. Influenced by the elegance of the Pictish art, the ring has a solid construction and accurate carving. In an usual 7mm and 8mm wide ring, the pattern repeats 6 times and 7 times respectively. The Abernethy Ring This variety displays a spiral knot. The band of the ring is either 6mm or 8mm wide with five spiral knots for both. Inspired by The Ardagh Chalice, this is a strong ring with lots of decorative knot works. The Celtic wedding rings are the continuation of the rich legacy that was nurtured in the Celtic churches in the 6th-9th centuries Ireland. They are still admired by those who prefer class over trend and magnificence over gimmicks. 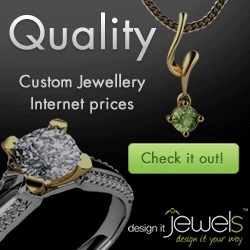 Thus your choice of a Celtic wedding ring speaks of your refined taste and respect for the tradition. We hoped this write up has help shed some light onto what Celtic jewelry has to offer. Have fun shopping around!